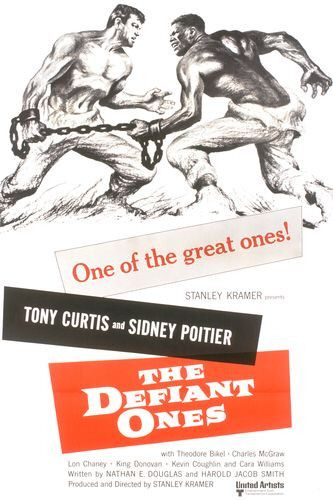 Random Film of the Week: The Defiant Ones | "DESTROY ALL FANBOYS!" Although he doesn’t appear until about 45 minutes into the film and has about seven minutes or so of screen time total, Lon Chaney Jr. plays a pivotal role in The Defiant Ones. As Big Sam, a burly, weathered old soul who saves the escaped duo from a lynching, he delivers a powerful speech against killing the men and beats down one of the angry mob before asking anyone else to step up and try their hand at murder. Given that the guy he slugged went down like a stone wall hit by a wrecking ball, no one decides to test their luck afterwards. If Stanley Kramer’s still powerful 1958 classic has a slightly weak link these days, it’s Tony Curtis’ solid but (to me at least) flawed performance as John “Joker” Jackson, half of the titular duo trying to get lost and separated from both the chains that bind them together and the posse of well-armed men tracking them. Sidney Poitier’s Noah Cullen makes for a stubbornly noble and heroic tragic character, but Curtis’ otherwise capable racist thug Joker is simply the actor overdoing himself mimicking Robert Mitchum. He turned down the role thanks to his own experience as a chain gang prisoner in the South who knew the chances of a black man being chained to a white man were absolutely zero, even though the script chalks it up to someone’s sick “sense of humor”. I recall reading once that a few people including Curtis spun this story into Mitchum not wanting to work with Poitier because he was black, but given the importance of this film and the two roles in importance to each other, I find it hard to believe an actor would turn down the opportunity unless he had a good reason. Granted, a good actor should be able to put himself into any role with ease. However, I can see Mitchum realizing his real-world experiences would probably hamper his performance somewhat, so I give him the benefit of the doubt. Curtis does play Mitchum excellently, however. The first few times I saw this film I had no idea of that back-story, so I was pretty enthralled by both actors in their landmark roles. Seeing the film again recently on TCM I was struck by a few things such as Poitier’s intentionally awful and loud singing that starts off and closes the film as well as the clever use of the vernacular in getting the obvious “N-word” out early and not going near it again save for a later scene when Cullen cuts off Jackson who’s about to insult him one too many times. Of course, there’s the scene when the men are about to sneak into that small village and Cullen reaches down, picks up some mud (hopefully it was mud!) and slaps it onto Jackson’s face as an impromptu disguise. Jackson doesn’t protest, as yes, he’s practically glowing in the moonlight and stealth is the only option for the men as they attempt to break into a general store and use its tools to break their shackles. While the film has a fair amount of humor (most of it musical in nature and involving the pursuers), one running gag isn’t supposed to be amusing at all but is (and very, at that). For some reason, after surviving a truck crash in the rain, a dive into a mud pit, rolling down bumpy hills, a fist fight and other indignities, the convicts continue to produce a stream of cigarettes and matches from their shirt pockets whenever there’s a break in the action for some expository scene. I noticed this the first time I saw the film as a kid and thought for a while that cigarettes and matches were waterproof and indestructible. Granted, there have been (and still are) waterproof matches, but cigarettes that can take that sort of beating OUTSIDE of a “crush proof” pack? Uh, yeah… riiiiight. Sure, there are one or two scenes with slightly bent smokes being puffed, but if you’re an old smoker, you’re probably chuckling right about now. Like many “message” films of the era, this one still packs a punch where it counts and yes, it’s interesting to see Hollywood films tackle social issues with relish. It was almost as if the powers that be thought films such as this one, On the Waterfront, 12 Angry Men, The Man With the Golden Arm and many others could get people to think (and act) outside their belief boxes while puffing up a studio’s coffers with oodles of ticket money. The old “win-win” in action, I suppose (unless your message film didn’t play well or play at all in some areas, of course). Nevertheless, it still works for what it is and if you’ve yet to catch this one, I say take the time to do so sooner than later. This entry was posted in DAF, Updates and tagged 1958, 2013, Classic Film, Commentary, Humor, Lon Chaney Jr., Movie Posters, Movie Trailers, Random Films, United Artists by geelw. Bookmark the permalink. Great tribute to Chaney’s role! His character is what I remember most about the film. Well, that and the frog eating scene. And I enjoyed the background info on the casting. Thanks for the fabulous contribution! This was a great choice. I want to see it again. We forget that Lon Chaney Jr could bring power and emotion even to tiny roles. Thank you. Ack! I forgot that Lon Chaney was in this film. It has been a while since I’ve seen it, and I need to watch it again. Pingback: Blu-Ray Review: Black Mama, White Mama | "DESTROY ALL FANBOYS!"